When I first heard about thumb tendon interposition surgery, the most common surgical treatment for thumb arthritis, I chuckled. Why? This procedure was first used to treat bad hip joints in small dogs. Was this really the best we could do? Hence, we got to work creating an injection procedure that would address all of the issues that caused the problem. Above is Debbie’s story, a nurse who couldn’t pick things up anymore, let alone play with her grandkids. This video is a great way to explain how we can now help most patients with thumb arthritis avoid invasive surgery. What Can Cause Thumb Pain and Dysfunction? There are a number of issues that can cause pain or throbbing in the thumb as well as disrupt function and mobility, including arthritis, ligament instability, or nerve problems. Thumb arthritis is actually quite common (interestingly, much more common in women than in men) and causes pain in the thumb and can make hand function difficult as humans rely heavily on their “opposable thumbs” for grasping, holding, and so on. It’s one of those things where you don’t realize how much you rely on it until it no longer functions properly. A lax ligament can create thumb joint instability, which can be a major instigator for the onset of arthritis. In addition, a nerve problem either in the median nerve in the wrist or even all the way up in the cervical spine can lead to arthritis in the thumb. When there is thumb pain and dysfunction, even just normal everyday tasks, such as washing the dishes, lifting a child, or driving can be extremely challenging. Debbie had three strikes against her as her thumb pain and immobility were not only due to arthritis but also lax ligaments and a nerve problem in the cervical spine. Read Debbie’s story below, and be sure to watch her video above. Debbie, a nurse for forty years, is an active grandmother of six. She had been having severe thumb pain and dysfunction including throbbing, and her muscles had begun to atrophy (shrink). Her pain was so unbearable, it would wake her up at night. Her thumb mobility was also severely impacted in that she was constantly dropping anything she tried to pick up. Even holding a magazine became impossible. Is a Dog Surgery Really the Best We Can Do? Debbie had seen a surgeon and was told she needed a tendon interposition procedure, which would have taken one of the patient’s nearby tendons and stuffed it into the thumb joint to provide a cushion for the arthritic thumb. Another surgical option was a thumb replacement or fusion. Clearly, these weren’t promising options at all for Debbie, and, indeed, the literature on these surgeries shows that they have high complication rates and some patients are pretty miserable despite the procedure. Fortunately, Debbie didn’t pull the surgery trigger, and, instead, she made her way to Dr. Schultz. The nerves that supply the upper limbs, including the hands and fingers, branch off of the cervical spine in the neck. If there’s a problem in the neck, it can affect the nerves anywhere along the nerve branch, even all the way down in the thumbs. This was indeed the case for Debbie, Dr. Schultz discovered, who had suffered a cervical spine injury in a car accident in the past. The nerves exit the cervical spine through the foramen, and Debbie had a narrowing of this space, compromising the nerves that control the muscles of the thumb, explaining the atrophy she had experienced in the muscle. This was one issue, and as mentioned before, she also had arthritis in the joint. A diagnostic ultrasound also identified those lax ligaments around her thumb, which was creating instability and a lack of support. How did Debbie do? Be sure to watch her moving video at the top of this post so you can hear it through her own words. In short, Debbie is now pain-free, can pick up her grandkids again, and can perform all of the tasks she’d been unable to for so long. The upshot? We can do way better than a dog surgery. 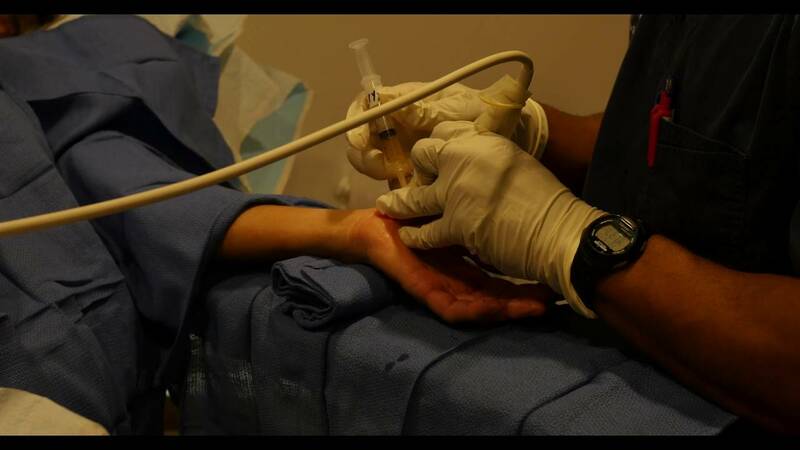 In our experience, precise image-guided injections into the thumb joint, ligaments, and irritated nerves can produce great results without the invasive surgery. In addition, the downtime is minimal and you can get back to what you love much more quickly! We have recently opened a Clinic in London/Birmingham, however, while they may be offering this procedure in the future, they are not offering it at this time. Would you be open to traveling? I wish this procedure was around 10 years ago. I had this surgery done to my left thumb joint to replace the Carpel Meta-Carpel joint that had become arthritic. The recovery pain was tremendous. Although the arthritic pain is gone, I am left with a deformed left hand and do not have the thumb strength I once had. Really sorry to hear that. Unfortunately, those types of results are not uncommon. Sadly, we published our first blog on this on this procedure back in 2009! Is this treatment available in Canada? Just some ideas about cost?/ Also do you need to inject more of one time? I means how long this procedure last? How many years? Unfortunately, we're not yet in Canada. To answer your questions we'd need more information through a Candidacy review. To begin that process, please submit the "Are You a Candidate" form to the right of the Blog.